Karpaka Vinayagar Temple is a 1600 year old Ganesha temple, located at Pillayarpatti, near Karaikudi, Sivagangai District of Tamil Nadu. Popularly known as Pillayarpatti Temple, Arulmigu Karpaga Vinayagar temple is one of the oldest cave temples in Tamil Nadu, India. The presiding deity, Desi Vinayaka Pillaiyar or Karpaka Vinayakar, is a 6 foot tall bas-relief carved out of an excavated cave. Lord Ganesh is seen with two arms and a trunk curled towards his right side (Valampuri Vinayagar). Karpaka Vinayakar idol is facing north which is said to be the direction of Lord Kubera – the God of Wealth. 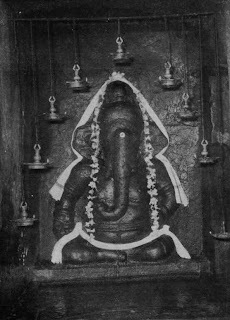 Karpaga Vinayagar idol is in meditation posture here with Shiva Lingam at his right hand (most Ganesha idols usually have mothakam in the right hand); hence Ganesha is also called Yoga Vinayagar (Ganesha with meditation and all fortunes), the one who grants success to all requests of his devotees. Arulmigu Karpaga Vinayagar Temple also enshrines Tiruveesar, a Shiva Lingam carved into the cave wall, and Marudankudi Eesar with his consort Vaadaamalar Mangai. A five-headed snake wearing a lingam on its neck is an important carving here. The temple also enshrines Pasupatheeswarar (who showers all wealth), Nagalingam (who gifts offspring to human beings), and Goddess Karthiyayini (who arrange marriages). The inscriptions within this temple dates back between 1091 AD and 1238 AD. There are 14 Agama texts found on stone sculptures in the cave from 500 BC to 1284 AD. According to the stone sculptures the ancient names of Pillaiyarpatti are Maruthangudi, Ekkattoor, Rajanarayanapuram, and Thiruveenkaikkudi. The temple features two Rajagopurams, a vimana, and a beautiful temple tank. Karpaka Vinayakar Temple is also known by the names Desigavinayaga Pillaiyar Temple, Vinayagar Cave Temple, and often Pillayar Temple. The 10 day annual Vinayakar Chaturthi festival is observed here during August – September. On the 9th day of Vinayaka Chaturthi, Desi Vinayakar is covered with about 80 kg of sandal wood paste (Santha-na-kkappu). Another ten day festival in honor of Kongu Nachiyamman, a village deity whose processional image is housed in the temple, is celebrated in the month of Vaikasi (May - June). Margazhi Tiruvathirai Festival is also held here in honor of Lord Nataraja and Sivakami during December - January. Karpaka Vinayakar Temple daily worship timings are from 6 am to 1 pm and 4 pm to 8.30 pm. Pillayarpatti is located 10 km west of Karaikudi in the Sivagangai District of Tamil Nadu. The nearest railway stations are Karaikudi Junction Railway Station and Pudukkottai Railway Station. Chennai Rameswaram Express and Kamban Express passes through these two railheads. Tiruchirapalli Airport or Trichy Airport, located on the NH 210 Tiruchirapalli - Rameswaram Highway, is the nearest air base. The Gokarneswarar Temple is located at Pudukkottai and the Kunnakkudi hill temple dedicated to Shanmukhanathar (Lord Muruga).